Background: The intratracheal instillation of bleomycin in mice induces early damage to alveolar epithelial cells and development of inflammation followed by fibrotic tissue changes and represents the most widely used model of pulmonary fibrosis to investigate human IPF. Histopathology is the gold standard for assessing lung fibrosis in rodents, however it precludes repeated and longitudinal measurements of disease progression and does not provide information on spatial and temporal distribution of tissue damage. 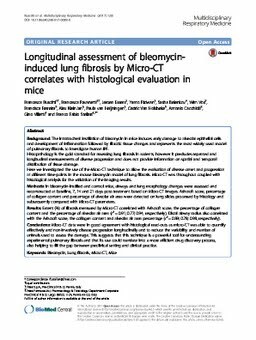 Here we investigated the use of the Micro-CT technique to allow the evaluation of disease onset and progression at different time-points in the mouse bleomycin model of lung fibrosis. Micro-CT was throughout coupled with histological analysis for the validation of the imaging results. Methods: In bleomycin-instilled and control mice, airways and lung morphology changes were assessed and reconstructed at baseline, 7, 14 and 21 days post-treatment based on Micro-CT images. Ashcroft score, percentage of collagen content and percentage of alveolar air area were detected on lung slides processed by histology and subsequently compared with Micro-CT parameters. Results: Extent (%) of fibrosis measured by Micro-CT correlated with Ashcroft score, the percentage of collagen content and the percentage of alveolar air area (r 2 = 0.91; 0.77; 0.94, respectively). Distal airway radius also correlated with the Ashcroft score, the collagen content and alveolar air area percentage (r 2 = 0.89; 0.78; 0.98, respectively). Conclusions: Micro-CT data were in good agreement with histological read-outs as micro-CT was able to quantify effectively and non-invasively disease progression longitudinally and to reduce the variability and number of animals used to assess the damage. This suggests that this technique is a powerful tool for understanding experimental pulmonary fibrosis and that its use could translate into a more efficient drug discovery process, also helping to fill the gap between preclinical setting and clinical practice.